A mid-week trip to the theatre is the perfect way to shake off the return of rain and kick-start the weekend. 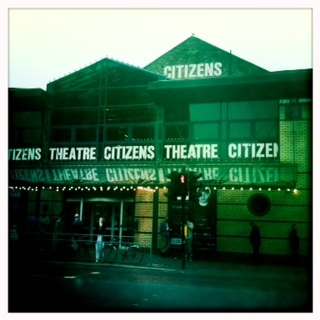 So I head to the Citizen’s theatre in the Gorbals for a Samuel Beckett double bill. 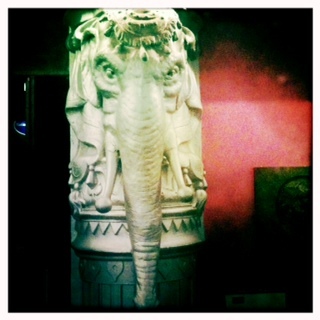 The outside of the building looks pretty functional but the foyer is a wonderful kitsch combination of life size elephants and bards. Shakespeare and Burns never looked better off set by shocking pink walls. The grand Victorian auditorium is a wonderful contrast; step back in time to an impressive surroundings offering up balconies and private boxes at the side of the stage adorned in magnificent golds and red. And don’t forget to look way up to admire the elevated domed ceiling. Despite its magnitude– the Citz still manages to be an intimate welcoming space rather than vast and overpowering. It’s one of those amazing venues that naturally exudes energy and excitement. I’m in my seat still trying to take it all in when the curtains open to reveal a very simple set. A lone man sits on his 69th birthday contemplating a recording he made about his life when he was 39. And even though I am totally absorbed in the performance – I can’t help but realise that this man and I are caught in parallel activities. I listen to him review a recording of his life as I am set to review a part of my life that he is now part of. In 30 years will I reflect on this blog, remembering this moment? Possibly. And just what will I think of my younger self? As the second oldest operational theatre in the UK, with an electric programme of events, classes and workshops, the Citz is a must see. Go for the experience but remember to appreciate the magical surroundings – because these walls talk so listen.